With winter in full swing, I am making my favorite Weight Watchers crock pot recipes on a very frequent basis. They are easy, hearty, and oh so comforting on a chilly day. Today, I’m sharing a Creamy Tarragon Chicken Recipe that was inspired by a Rachel Ray recipe, but made over to be lighter and more Weight Watchers friendly. 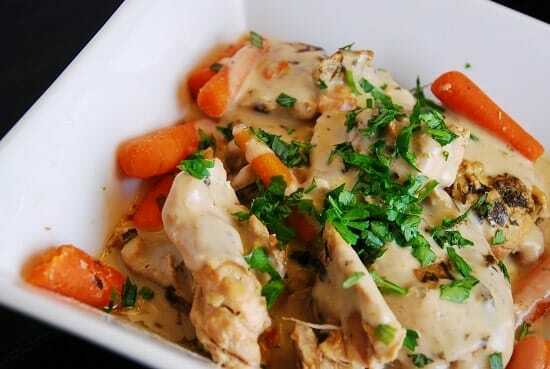 It is absolutely amazing…so flavorful and rich, and the sauce is so creamy and velvety. Each serving is just very low in fat and calories, which is hard to believe once you taste how good it is. Since I rarely cook with tarragon, this dish was a real treat and had me wondering why I don’t cook with tarragon more often. I used carrots in this dish, but feel free to use another vegetable if you prefer. Asparagus, broccoli and peas work really well with it. I recommend serving this Creamy Tarragon Chicken over some buttered whole wheat noodles or buttered brown rice for a complete meal. Enjoy! How does one adjust the recipe for 1 1/2 pounds of chicken breast? Can I cook this for 8 hrs instead? can’t wait to try this tomorrow–it sounds delicious! it’ll be my very first crockpot meal. I just made this and loved it! Such an easy way to make a creamy sauce and it really elevated the dish. I think it is a really sophisticated dish that I would happy to make for a party! Just made this recipe..the sauce gives it a very decadent feel. Very satisfying…thanks! This didn’t end up working well for me. I think we just didn’t enjoy the tarragon flavor. I wonder if I could adapt the recipe with a different herb? I used thyme because that was what I had and I think it enhanced the dijon mustard. I would recommend it! This came out great! Another flavorful and easy dish. (I subbed flour for the cornstarch, as I didn’t have any.) Came out great! I liked as is, but found the dijon very subtle. If anyone really likes their mustard, they may like to add more. I thought it was tasty as written though. Do the carrots go in the crockpot as well or are they cooked separately? The carrots go in the crock pot too. yum! this recipe is great for a cold day!